All these items are made to order - standard and bespoke (made to measure). Dispatched in 10 working days. Delivery is 2-3 working days. 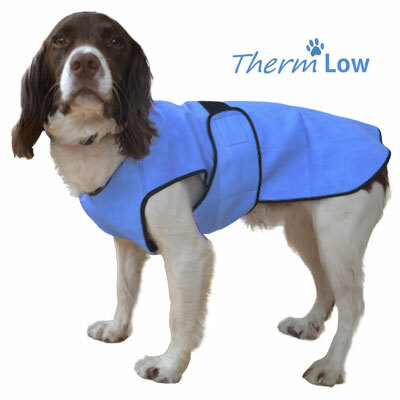 The ThermLOW dog cooling coat is the simple way to keep your dog cool and comfortable even on a hot summer’s day. 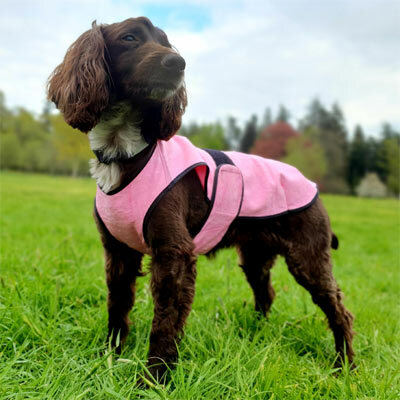 Our cool coat has been designed for the best fit (a customised fit is even available) and the most effective cooling you can find, with the chest covered as well as your dog's back. The high quality, super absorbent, evaporative material gives amazing cooling, indoors or out. Simply activate the jacket with ordinary tap water and let it work its magic. ThermLOW is the best cooling coat on the market, in our opinion, and here's why. The fabric we use is of the highest quality, unlike cheaper alternatives. 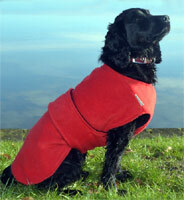 Quality fabric absorbs water better, giving a much longer lasting and effective cooling experience for your dog. We have also included a chest section to ThermLOW - something not offered in any other cool coat on the market. Each garment is expertly handmade in the UK and beautifully finished, for years of use. Not only that but if your dog is not a standard size, do not worry. 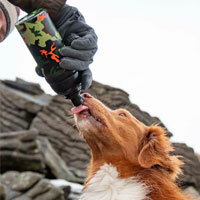 For just an extra few pounds your dog can have one made exactly to their own measurements. Woof! Get the best. ThermLOW is the only cool coat we recommend. Provides relief from the effects of heat in hot weather and during or after exercise. Perfect for walks, travelling and activities. Can even be used indoors. 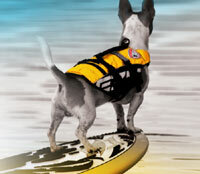 Specially designed to keep your dog cool in situations where they are at risk of feeling hot or overheating. Your dog will feel comfortable and cool. No heavy materials, chemicals or bulky gels - just a special lightweight absorbent material activated by water. These cooling coats are soft, light, comfortable to wear and 100% safe. You will be amazed at how well they work. 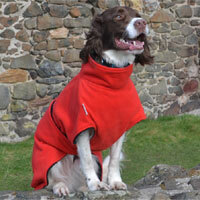 Other cooling coats tend to be a standard jacket cut that lays over the dog’s back and fastens at the front and belly. The ThermLOW is different. 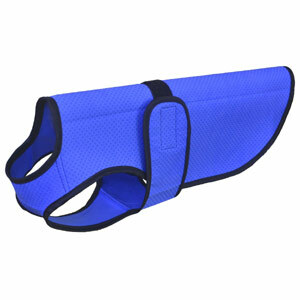 This cooling vest pops over your dog’s head for the perfect fit and an adjustable Velcro tummy strap secures it. 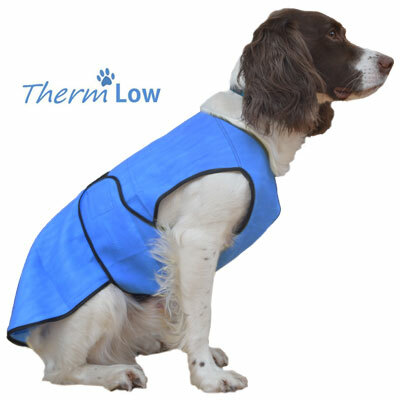 ThermLOW's clever design means that the vest covers your dog’s chest as well as their back, covering and cooling more areas of your dog than other designs on the market. It also makes it much less likely to slide sideways when in use. 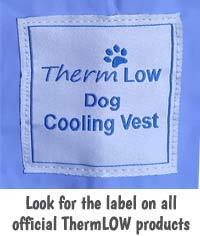 Your dog will feel comfortably cooler - not cold or chilly but just right. The material is durable and won’t easily rip or tear. You can expect years of use and will soon wonder how you managed without it. How do I use ThermLOW? Soak in water from the cold tap for a few minutes, until soaked through. 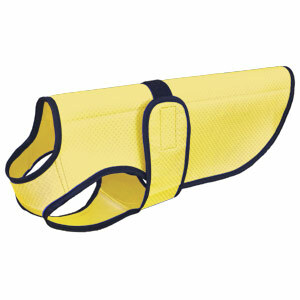 Lightly squeeze out any excess water, place your dog’s head through the vest and secure with the Velcro straps. Top up with water whenever it starts to dry out. If using every day, you can store it slightly damp in the sealable bag provided. Otherwise, hang to dry. Don't try to unfold or flatten the coat when it is dry. Soak it first to soften the material. Made from PVA (Polyvinyl Alcohol) foam. This material is markedly greater than other materials at absorbing and retaining water. It is also durable. The ability of PVA foam to retain water makes it ideal for cooling products. The water held in the material slowly evaporates, drawing heat away from your dog’s body and reducing their temperature. The cooling effect lasts until the coat starts to dry out, which can be an hour or two on a very hot day and quite a few hours on a typical warm day. To reactivate simply soak in water again or poor some water over it. 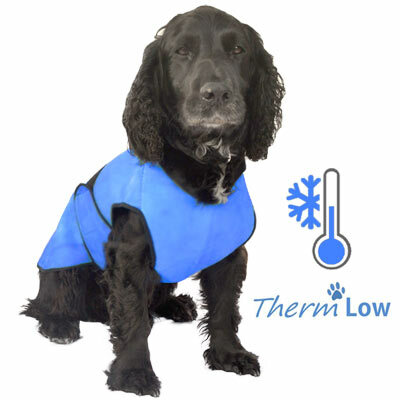 Use at home, on walks, travelling in the car, during activities such as Agility or Flyball, after exercise - any time you need to prevent a rise in temperature or lower your dog's temperature. It is best used as a preventative measure but can also be used to reduce a dog’s temperature if they are already feeling the effects of heat. Your dog will visibly pant less and will be able to enjoy walks and activities for longer and on warm days than they can without the cooling vest. It will feel cool to the touch. Touch it and see. Or put your hand under the coat and you will notice your dog feels noticeably cooler. 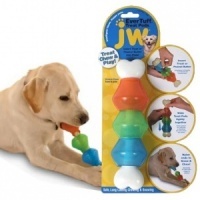 Can be worn outside or even indoors to cool your dog down. If necessary, gently hand wash or machine wash at 30 degrees. Do not tumble dry. Please measure your dog to get the correct fit. Use a soft tape measure and measure your dog when they are standing up. * Sizes C1, C2 and C3 have been designed to suit breed shapes such as (but not exclusive to) French Bulldogs, Pugs and Boston Terriers. ** Large Wide is suitable for stockier bodies (e.g. Lab) while Large Deep is suitable for deep chests (e.g. Vizsla, Pointer, Dalmatian). 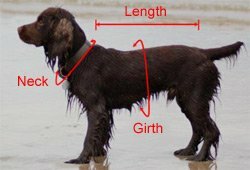 *** Please note that the neck hole measurement given above is NOT the dog's neck measurement - it is the size of the actual neck hole of the garment. The neck hole is generally about 10% larger than a dog's actual neck measurement. This is useful information if you have a dog with a wide neck and you are ordering a standard sized garment. If you are ordering a bespoke garment (made especially to fit your dog if they do not fit any of the standard sizes above), please choose a bespoke length from the size drop-down box and then enter your dog's actual measurements in the boxes provided. The maker will use those measurements to make a coat that fits your dog. Approx. 10% is added to the neck measurement so that it sits comfortably at the neck and fits over the dog's head. Please measure carefully and state your dog's measurements in centimetres (cm). Must be returned in the sealed bag provided and still in its soft and supple state. Try the coat on your dog. If it does not fit please fold it back up and put it straight back into the sealed bag. Coats should not be soaked or allowed to dry out if they are going to be returned or exchanged. Thank you. Returns or exchanges cannot be accepted for bespoke coats (where you have supplied measurements and the coat has been made to fit your dog). Heat stress in dogs - do cooling vests actually help? Communication was spot on. Delivery was very quick. Product appears to be well made. I can not state if it worked or not because I haven’t had the opportunity to try it out yet the English weather has changed but I have every confidence that it will do the job. Really pleased with the cooling coat. The material is thinner than I'd expected meaning that it is really flexible & my dog seems to find it extremely comfortable. Some cooling coats seem to be quite thick with foam-like material whereas this is more like a synthetic chamois. Stays cool for hours once wetted & easy to see when it starts to dry out & needs re-wetting. We needed a bespoke fit & it's perfect! Thank you. I'm very pleased with the Thermlow cooling coat that I ordered for my Rough Collie. I had to order a bespoke coat as his large 'mane' and deep chest made the standard sizing too small to fit him without a struggle.The help and reassurance that I had from customer services, and the person that actually makes the coats, was excellent. The coat arrived 10 days later, and it fits him very comfortably and securely. Within a very short space of time he had forgotten that he had it on and was happily running around playing football, except that this time he didn't get too hot and bothered. It has been a godsend in this very hot weather, and is well made and easy to use. Thank-you D for Dog! A must for hot weather! Great quality coat and has good cooling qualities. Unfortunately the one for my dog is a little short. Be careful with measurements when ordering. I could have returned it but I forgot to follow instructions for returning and let it dry out. It will still serve purpose. My Cane Corso loves this cool coat! Great quality, super fit (custom design), lovely customer service team. Great value for money!